It was an empty night of whining about the media, petty squabbling, and lost opportunities for the Republicans who would be president. The billionaire contender’s disdain for the whole affair was appropriate after an empty night of whining about the media, petty squabbling, and lost opportunities for the Republicans who would be president. 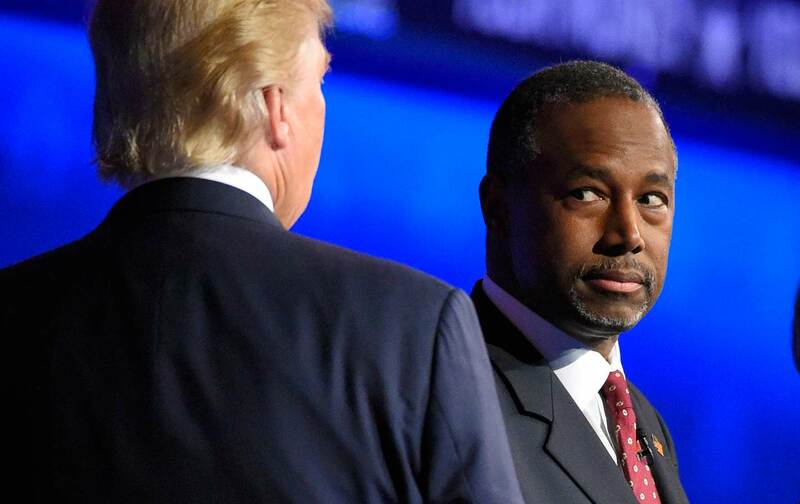 Dr. Ben Carson seemed to lose interest in his own answer to the first question he got from the CNBC panel and never really reengaged—except with a bizarre attempt to both deny and defend his role as pitchman for the nutritional-supplement maker Mannatech. Jeb Bush lost what may have been his last chance to save a sinking campaign; his listless performance suggested the former front-runner has already decided he has something better to do than run for president. Bush got very little screen time, and did very little with it. He said at one point that he would give a “warm kiss” to a Democrat who did the right thing. He also said, “I can’t fake anger.” Actually, Bush had a hard time faking viability. John Kasich lost his nerve and never went after the front-runners, as his pre-debate speeches and media appearances suggested he might finally do. He was reduced to recalling George H.W. Bush’s “thousand points of light” in an effort to convince conservatives they should be concerned about college debt. Memo to Kasich: Conservatives just aren’t that into the Bushes. Marco Rubio and Ted Cruz lost the point of the “freedom of the press” protection outlined in the First Amendment to the US Constitution—repeatedly attacking panelists from a business-friendly cable network for asking mildly probing questions. There is nothing wrong with challenging the media, and the CNBC panelists gave the critics plenty to gripe about. But for Rubio, in particular, this was something else—a debate tactic. Instead of responding to legitimate inquiries regarding his dodgy personal finances and missed Senate votes, Rubio tossed off rehearsed lines about the failings of a mythological liberal media. The crowd loved it when the senator said, “The Democrats have the ultimate ‘super PAC’; it’s called the mainstream media.” But he still didn’t answer the questions. Carly Fiorina lost whatever ground she had gained in previous debates when the chief question she was asked in this one had to do with her miserable tenure as the CEO at Hewlett-Packard. And she had to feel at least a little uncomfortable when Chris Christie started talking about jailing CEOs. Good answer—not for a Republican primary, perhaps, but certainly for a general election. And, though the candidates don’t seem to be thinking much about November 2016, that is ultimately where the Republican nominee will face his or her day of reckoning. There was one other general-election answer. And it was a very good one, even if it came from an otherwise lamentable candidate who is exceptionally unlikely to be his party’s nominee. That was not anything like the answer most of the other Republican presidential contenders gave. That was not anything like the answer soon-to-be House Speaker Paul Ryan has given—or will give. That was, however, the right answer morally. That was the right answer practically. And that was the right answer for a general election—which is something that Republicans and Democrats will recognize a year from now.